There are a few who shall consider emotional investment as a guaranteed loss or forgoing profits. For instance, let’s have a look at India’s Warren Buffet – Rakesh Jhunjhunwala. Investing solely on the basis of emotions is not considered a safe or sound way of managing your capital. There are a few who shall consider emotional investment as a guaranteed loss or forgoing profits. For instance, let’s have a look at India’s Warren Buffet – Rakesh Jhunjhunwala. He started investing from the young age of 25. Although he started with a mere Rs10,000, today his net worth is nearly Rs20,000cr, as per Forbes data. He is considered to have played an instrumental role in the Indian stock market and his statements and transactions influence market sentiments. They both started from modest backgrounds. Rakesh Jhunjhunwala was born in Mumbai to a Marwari family. His father worked in the income tax department and he took initial lessons in investment from his father. When he tried to understand the share market for the first time, his father advised him to keep a closer look at the newspaper, a habit which he follows even today. As Buffet’s father was a stockbroker, he too demonstrated his aptitude for finance since a young age. He holds a Master’s degree in economics, while Jhunjhunwala is a qualified Chartered Accountant. Jhunjhunwala’s father had advised him to never invest in the market with borrowed funds; this is something both Buffet and Jhunjhunwala strictly follow. Warren Buffet is a value investor. 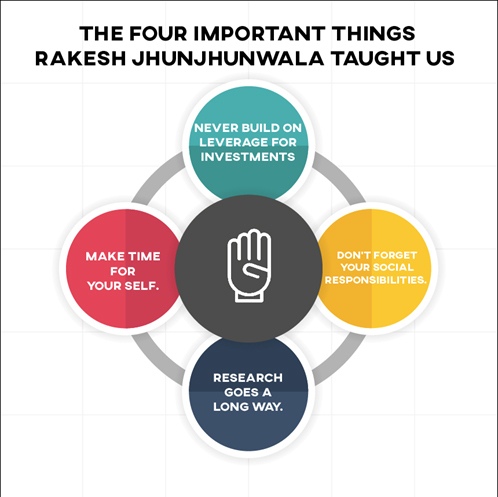 Rakesh Jhunjhunwala, too, strongly believes that before investing, one must do proper research. If you fail tomorrow, you cannot blame the company or its promoters. Hence, one of the major parts of their daily routine is reading financial books, journals, and reports. Despite being stock market wizards and managing billion in assets, they are known to be family men and love to spend quality time at home. Rakesh Jhunjhunwala-owned stock trading firm Rare Enterprises also derives its name from the first two letters of his and his wife’s name (RAkesh, REkha). Presently, Jhunjhunwala is the 54th richest man in India, while Warren Buffett is worth $85bn, as per Forbes data. They are both known to be philanthropic men who donate substantial amounts in charity.